This recipe contains fresh mango pulp, lemon juice & sugar. 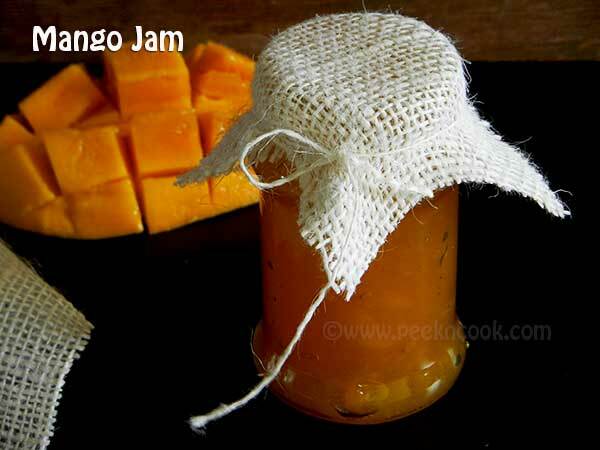 Flavorful mangoes are best to use for this jam, because the jam will smells awesome. Take the chopped mango pieces, lemon juice & sugar in a sauce pan and start cooking on low flame. At first the sugar will start melting & mango pieces will start to be soft. Just keep starring. Let it cook further for 5-6 minutes until the mangoes get cooked. Mash the mango pieces with ladle. When there will be no big chunks left in the jam and it look like sticky your jam is ready. Check your jam by taking a little in a wooden ladle and drawing a line on a plate of bowl. The strike should be firm and now flowing/ runny. Now your jam is perfect. Turn off the heat and let it cool down completely. After cooling down, the jam will thicken little bit. Now pour the jam into a strillized bottle and enjoy till it lasts with bread or crackers. This recipe is going to Kolkata Food Bloggers for Mango Festival. To find more recipes pls go to the page.